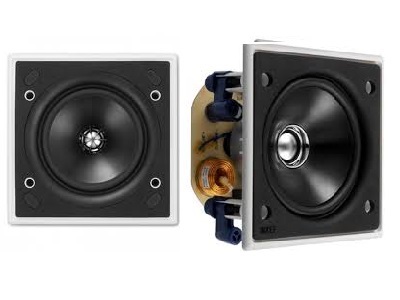 The Kef Ci1002Qs is the latest edition to the Kef Uni-Q custom installation speaker family, purpose built for direct flush mounting into ceilings or walls. 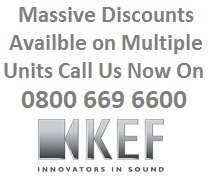 Designed to smoothly integrate and architecturally match with existing ceiling fixtures, KEF’s trademark Uni-Q technology has a decisive performance advantage in these applications, because each point source driver array evenly disperses the sound, ensuring a smooth frequency response over a large area to create a spacious three-dimensional soundscape with genuine texture and depth. With a two-way Uni-Q driver of 100mm (4”), the Ci100QS is as satisfyingly musical to hear as it is neat in appearance. The Ci1002qs delivers Hi-Fi quality sound through a low frequency driver with a high frequency driver mounted at the acoustic centre of the LF drive unit. The bezel and grill can be painted to match the interior decor of the room. The Ci100QS is a square speaker providing yet more interior design possibilities purpose built for flush mounting into walls and ceilings these are the latest addition to the KEF Uni-Q Custom Installation series. Providing a compact solution to the problem of Hi-Fi quality sound from an in-wall/ceiling speaker, the Ci100Qs consists of a polypropylene cone LF driver with the HF unit mounted at the acoustic centre of the LF unit. The bezel and grill can be painted to match the interior décor. The Ci Series Ci 100QS consist of: 1 X 19mm aluminium dome tweeter 100mm white polypropylene cone with double neo compound magnet system. Performance of the Ci 100QS shall meet or exceed the following criteria: frequency response 1 metre on-axis with swept sinewave shall be 120Hz to 22kHz , sensitivity shall be at least 86dB for 2.83V@1m. The 2.83V@1m. The driver impedance shall be 8 ohms.